Cattle (commonly called cows), are among humankind's most important domesticated animals. They are even-toed ungulates or hoofed mammals, of the species Bos taurus of the family Bovidae, or bovids. Through history, they have had a tremendous effect on human culture, economy, and religion. Cattle were originally identified by Carolus Linnaeus as three separate species. These were Bos taurus, the European cattle, including similar types from Africa and Asia; Bos indicus, the Zebu or humped cattle found in India; and the extinct Bos primigenius, the aurochs. The aurochs are considered ancestral to both Zebu and European cattle. More recently these three have been grouped as subspecies under one species: Bos taurus; although some have suggested using the names Bos primigenius taurus, Bos primigenius indicus, and Bos primigenius primigenius. This article refers to domesticated forms of both the European cattle and the Zebu. The word "cattle" did not originate as a name for this group of bovine animals. It derives from the Latin caput ("head"), and thus originally meant "unit of livestock" or "one head." The word is closely related to "chattel" (a unit of property) and to "capital" in the sense of "property." Older English sources, such as the King James Version of the Bible, refer to livestock in general as "cattle," and cattle as "kine" (which comes from the same English stem as cow). Other species of the genus Bos are also often called cattle or wild cattle. An adult female over two years of age (approximately) is called a cow. An adult, intact (not castrated) male is called a bull. Young cattle are called calves. A young male is called a bull calf; a young female before she has calved the second time is called a heifer (pronounced "heffer"). A young female that has had only one calf is sometimes called a "first-calf heifer." In the United States, male cattle bred for meat are castrated unless needed for breeding. The castrated male is then called a bullock or steer, unless kept for draft purposes, in which case it is called an ox (plural oxen), not to be confused with the related wild musk ox. A male is called a stag if it is castrated as an adult. The adjective applying to cattle is bovine. The term cattle itself is not a plural, but a mass noun. Thus, one may refer to some cattle, but not three cattle. There is no singular equivalent in modern English to cattle other than the various gender and age-specific terms (though "catron” is occasionally seen as a half-serious proposal). Strictly speaking, the singular noun for the domestic bovine is ox: a bull is a male ox, and a cow is a female ox. That this was once the standard name for domestic bovines is shown in place names such as Oxford. But "ox" is now rarely used in this general sense. Today "cow" is frequently used incorrectly as a gender-neutral term, although it is meant to be used solely to mean females (females of other animals, such as whales or elephants, are also called cows). To refer to a specific number of these animals without specifying their gender, it must be stated as (for example) ten head of cattle. Some Australian, Canadian, New Zealand, and Scottish farmers use the term cattlebeast or simply "beast." Obsolete terms for cattle include neat (horned oxen, from which "neatsfoot oil" is derived), beef (young ox), and beefing (young animal fit for slaughtering). In common use, the term oxen does not signify a unique bovine, but rather large and heavy set breeds of Bos taurus cattle trained as draft animals. Often they are adult castrated males. The meat of cattle is called beef. If the meat is from young calves, it is called veal. Cattle raised for human consumption are called beef cattle. Within the beef cattle industry in parts of the United States, the older term beef (plural beeves) is still used to refer to an animal of either gender. Cows of certain breeds that are kept for the milk they give are called dairy cows. Cattle belong to the Bovidae family. There are about 140 species of bovids, including buffalo, bison, antelopes, gazelles, and both wild and domesticated sheep, goats, and water buffalo. Cattle belong to the biological subfamily Bovinae (or bovines). This includes a diverse group of about 24 species of medium-sized to large ungulates, including bison, the water buffalo, the yak, and the four-horned and spiral-horned antelopes. General characteristics include a cloven hoof and usually at least one of the sexes of a species having a true horn. Very closely related to cattle are the other members of the genus Bos. The yak, Bos grunniens, is native to the Himalaya Mountains of central Asia. Yaks are a very important domestic animal to the people of the area. They are also found wild. The gaur, Bos frontalis, is native to India and Southeast Asia. It is also found both wild and domesticated. The banteng, Bos javanicus, is native to Southeast Asia and the island of Bali, where it has been domesticated and is known as "Bali cattle." The kouprey, Bos sauveli, is very rare and is found only in a small area near the border of Thailand, Cambodia, and Laos. It is not known to have ever been domesticated. All of these species, as well as bison, Bison bison and Bison bonasus, can interbreed with domestic cattle. Interbreeding with domestic cattle is not known with certainly in the case of the kouprey (Huffman 2006; Clutton-Brock 1999). Cattle, like other bovids, are ruminants. They have a unique digestive system that allows them to digest cellulose and other otherwise unpalatable plant materials with the aid of symbiotic microorganisms living in their rumen, or first stomach. Cattle eat mainly grasses and leaves. They need to eat about 70 kg (150 lbs) of food every day. They also need water every day and are dependent on a ready water supply. Like most bovids, both male and female cattle have two horns on their heads, which are used in fights between individual cattle as well as to fight off predators; modern hornless breeds are an exception to this. Like all mammals, cows produce milk to feed their young. Cows are very protective of their calves. The gestation period for a cow is nine months. A newborn calf weighs approximately 35 to 45 kg. Cattle can live as long as 25 years old. Cattle are social animals, naturally living in groups or herds. In a herd, individuals support each other by watching for predators, grooming each other, and helping each other find food and water. Among the cows in a herd, there is a system of dominance with one cow the most dominant and the others ranked down to the lowest individual. There is also often a cow that acts as a leader and initiates movement to new feeding areas (Budiansky 1992). The extinct aurochs (pronounced ou' roks or our' oks) were found throughout much of Europe, Asia, and northern Africa. They arose about two million years ago in Asia, migrated into the Middle East and further into Asia, and reached Europe about 250,000 years ago. Some were domesticated about the sixth millennium B.C.E., becoming ancestral to modern cattle. The aurochs were heavily hunted by early humans and because of this, and because of the conversion of their habitat to farm land, they gradually became extinct. In historical times, their range was restricted to Europe, and the last one was killed by a poacher in Masovia, Poland, in 1627. Pottery bull from Iran, 1250 B.C.E. The auroch was a large animal. Bulls stood about 1.7 meters (5.6 ft) tall at the shoulders and weighed about 900 kg (2,000 lbs). Cows were about 25-percent smaller. Aurochs cows and calves were red, while the bulls were black. Aurochs mainly lived in partly forested areas near rivers or streams. They formed herds with one dominant male and several females and their young. Other males lived in herds of their own (Nowak 1983). The first evidence of the domestication of cattle comes from the Middle East about 8,000 years ago. Over time, domestic cattle became smaller than their wild ancestors. The most important early use of cattle was as draft animals, mainly to pull plows. They were also killed for their meat and sometimes as sacrificial animals. They were sometimes milked, but this was secondary in importance (Clutton-Brock 1999). You know, the great thing about the cow is that she can eat plants we don't, on land the farmer might not own, and convert milk into cash for the farmer. So a cow was often the most valuable thing a farmer owned. Even during a drought, they would hold some value. So cows became an icon for value; they were simply the most valuable animal around (PBS 2004). Different breeds of cattle came into being, mainly depending on environmental conditions in different locations. The Egyptian Longhorn was one of the first distinct breeds to develop and is pictured in the pyramids, and may be among the ancestors of modern African cattle. The Zebu breed, also called Braman, developed in India. Zebus have a greater resistance to heat and insects than other breeds. Cattle were brought to North America by the Spanish in the 1500s; from them developed the Texas Longhorn'. In the 1700s and 1800s, serious effort began to be made to improve the breeds of cattle by selection and cross-breeding. Modern cattle breeds are mostly specialized to provide milk or meat and are much more productive than those of earlier times. Among the most common modern cattle breeds are the Holstein-Friesian and the Jersey for milk, and the Angus and Hereford for meat (OSU 2006). Cattle have appeared in art from prehistoric times. Cattle have also been important in religious traditions in many cultures. A shrine in Turkey from around 8,000 years ago featured auroch horns set into the altar (Clutton-Brock 1999). 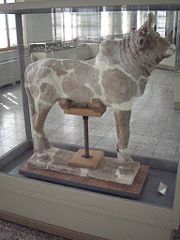 In ancient Egypt, the cow was associated with the mother goddess Isis, and in ancient Greece, the bull was associated with the father god Zeus. In both Western and Chinese astrology, the bull or ox is one of the signs of the zodiac. In Judaism, cattle were among the animals that were sacrificed, and in Christianity, the ox, or calf, is one of the four beasts in Revelation and is associated with Saint Luke. "The cow to me means the entire sub-human world, extending man’s sympathies beyond his own species. Man through the cow is enjoined to realize his identity with all that lives. Why the ancient rishis selected the cow for apotheosis is obvious to me. The cow in India was the best comparison; she was the giver of plenty. Not only did she give milk, but she also made agriculture possible. The cow is a poem of pity; one reads pity in the gentle animal. She is the second mother to millions of mankind. Protection of the cow means protection of the whole dumb creation of God. The appeal of the lower order of creation is all the more forceful because it is speechless" (Yogananda 1946). Cattle have been used in sport as well. Bull-leaping, a central ritual in Bronze Age Minoan culture, still exists in southwestern France. In Portugal, Spain, and some Latin American countries, bulls are used in the sport of bullfighting, while a similar sport, Jallikattu, is seen in south India. Other sports such as calf roping and bull riding are part of North American rodeos. The world cattle population is estimated to be about 1.3 billion head. India is the nation with the largest number of cattle, about 400 million, followed by Brazil and China, with about 150 million each, and the United States, with about 100 million. Africa has about 200 million head of cattle, many of which are herded in traditional ways and serve largely as tokens of their owners' wealth. Europe has about 130 million head of cattle (CT 2006, SC 2006). Cattle today are the basis of a many billion dollar industry worldwide. The international trade in beef for 2000 was over US$30 billion and represented only 23 percent of world beef production (Clay 2004). The production of milk, which is also made into cheese, butter, yogurt, and other dairy products, is comparable in size to beef production and provides an important part of the food supply for much of the world's people. Cattle hides, used for leather to make shoes and clothing, are another important product. In India and other poorer nations, cattle are also important as draft animals as they have been for thousands of years. 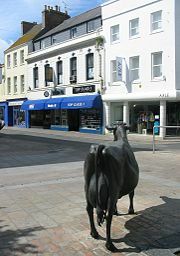 Concerns have been expressed about the impact of cattle on the environment. Pasture land for cattle grazing is now the largest agricultural land use worldwide. The conversion of natural environments to pasture land has threatened native plants and animals in many places; this is especially a problem in Brazil where large areas of rainforest are being cut down for cattle pasture. Cattle naturally produce methane gas though their digestive process and, because of their large numbers, this is thought to contribute to the process of global warming. Cattle keeping also can contribute to water pollution, air pollution, and soil degradation (Clay 2004). Feral cattle, domestic cattle which have returned to the wild, are also an environmental problem in many places (ISSG 2005). A large part of the grains, legumes, and other crops grown worldwide are used to feed cattle. Cattle keeping is also a big user of water, gasoline, and other energy sources. It has sometimes been asked if it would benefit humanity more if the cattle population was less and more of these resources were used to feed people directly (Clay 2004). Bhattacharya, S. 2003. “Cattle Ownership Makes It a Man's World.” Newscientist.com. Retrieved December 26, 2006. Huffman, B. 2006. “The Ultimate Ungulate Page.” UltimateUngulate.com. Retrieved December 26, 2006. Invasive Species Specialist Group (ISSG). 2005. “Bos taurus.” Global Invasive Species Database. Oklahoma State University (OSU). 2006. “Breeds of Cattle.” Retrieved January 5, 2007. Public Broadcasting Service (PBS). 2004. “Holy Cow.” PBS Nature. Retrieved January 5, 2007. Spectrum Commodities (SC). 2006. “Live Cattle.” Spectrumcommodities.com. Retrieved January 5, 2007. This page was last modified on 14 November 2008, at 00:07.